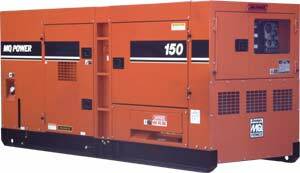 The DCA-150SSJU3C boasts 165kVA/132kW standby output and 150kVA/120kW prime output. The generator is powered by a 190-horsepower, 6-cylinder John Deere diesel engine and the unit controls voltage regulation to +/-1.5 percent no load to full load. Sound level is an astounding 68dBA full load at 23 feet — the quietest generator on the market.